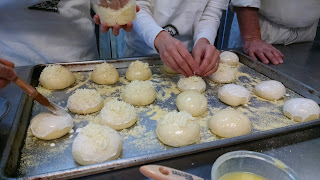 First we made all the doughs and let them rise while we had our lecture. 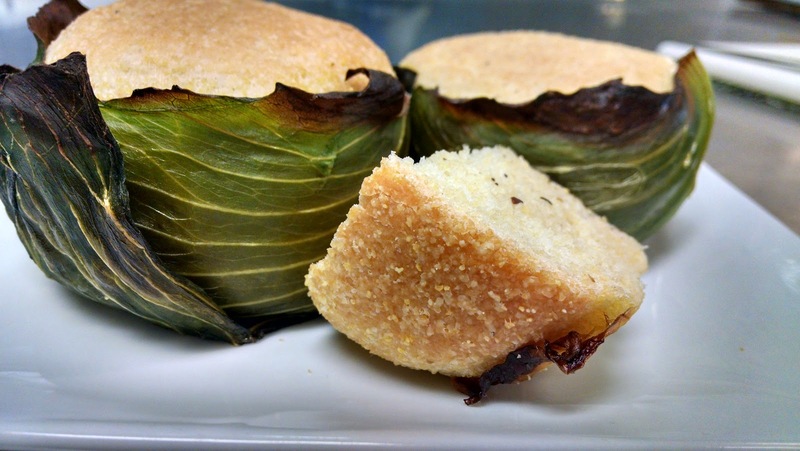 I made the Petit Pain Meture, which is a corn bread that is baked inside cabbage leaves. After I made the bread dough I had to blanch the leaves and keep them in a bowl of ice water until it was time to proof the bread. 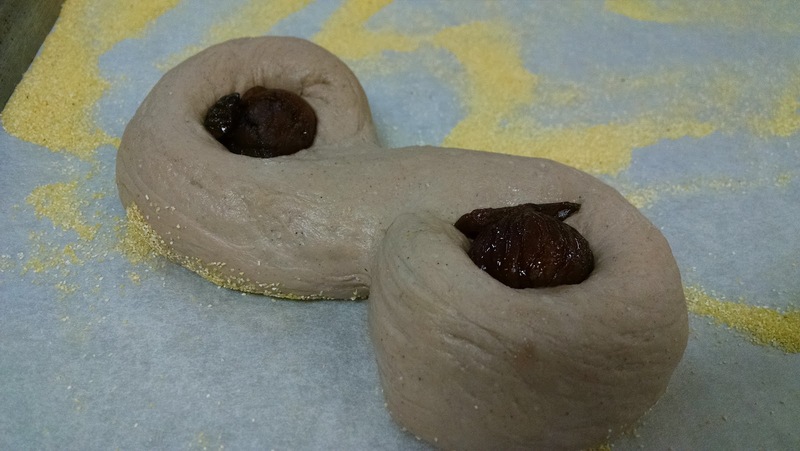 When the dough had risen, each recipe was divided up so we could shape each of the breads. This allowed us all an opportunity to practice making different shapes and to work with the different textures. 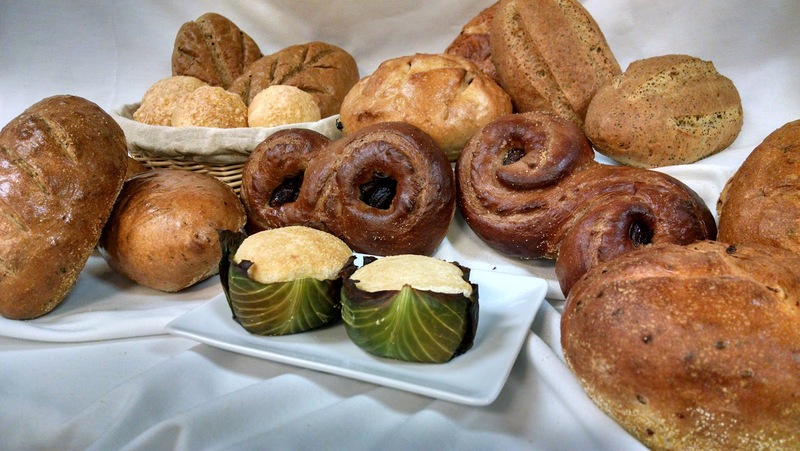 For example, the chestnut bread and the 4 grain bread had less gluten than the others so they felt different. I learned some things about shaping and proofing that I'd been doing incorrectly for years. This is exactly what I wanted to learn! The cabbage bread (Petit Pain Meture) was particularly fun. I lined most of the baking rings with blanched cabbage leaves and then everyone popped their rolls into the leaves. We had 3 rolls that didn't get cabbage and you could definitely tell the difference. The cabbage keeps the bread moist and changes the flavor. 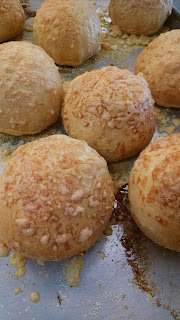 While things were proofing we had another part of our lecture and then it was time to start baking. Pans were going in and out of the oven constantly. Nothing is timed, either. Chef Delphin just knows. He kept one eye on the clock and never seemed worried that something would get too toasty. He has a calming presence in what could be a rather stressful environment. The cheese bread was the most popular - as soon as it came out of the oven we all grabbed a roll and ate them while they were still hot. They smelled wonderful and tasted pretty awesome, too! Ultimately, almost every bread got tasted throughout the day; when they came out of the oven we would slice one loaf and everyone could try some. The Red Pepper and Olive bread was also popular. In addition to bringing home my portion, I brought home some of the leftover slices (after eating some for dinner with a mushroom pate courtesy of the savory students) as I had an idea to make croutons with the pepper-olive bread but I don't think there will be any left. Our evening lecture was all about chocolate - how it's farmed, how it's made, how to choose it - followed by a chocolate tasting. What a fabulous day!